Our mission is to strengthen creative connections between Iowa State University and the Ames community through exhibitions, arts education, artist-led projects, and interactive events. 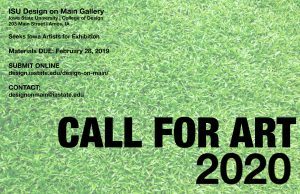 The College of Design, Iowa State University (ISU) gallery at Design on Main is accepting proposals for exhibitions by established and emerging visual artists currently living in Iowa. This excludes faculty and students at Iowa State University. Exhibitions may be proposed during the spring and fall semesters of 2020. The deadline to submit your proposal is February 28, 2019. Proposals received after that date will may not be considered. The Design on Main Gallery is located in the heart of the downtown Ames art community at 203 Main Street. Ames continues to be recognized as an exemplary city, winning eight national awards in 2016 alone. The Gallery was created by ISU’s College of Design to provide an exhibition venue for community and student artists. Submit the above materials via website www.design.iastate.edu/design-on-main/: by February 28, 2019. For further information, e-mail: Catherine Reinhart, Gallery Manager and Artist-in-residence, at designonmain@iastate.edu.